Someone found a really nice place for this “living museum”. In the entrance you decide what you want to do. 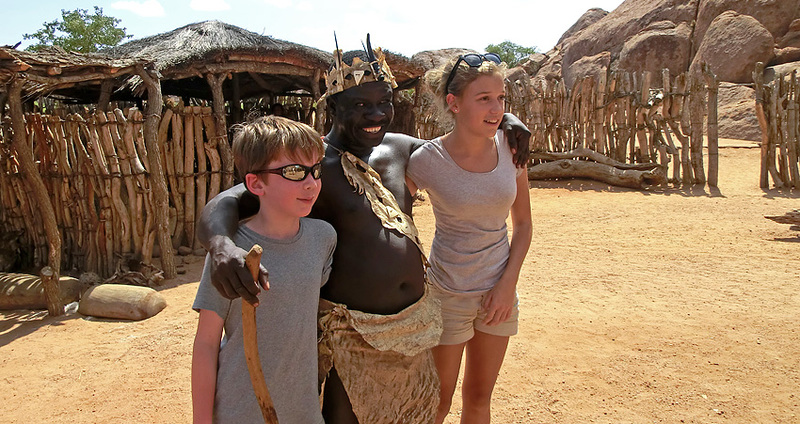 We decided on just “Traditional Life in the Village” but there is also a possibility to join a bushwalk or other activities. After passing through huge boulders you enter the village. This is the “Damara Living Museum”. 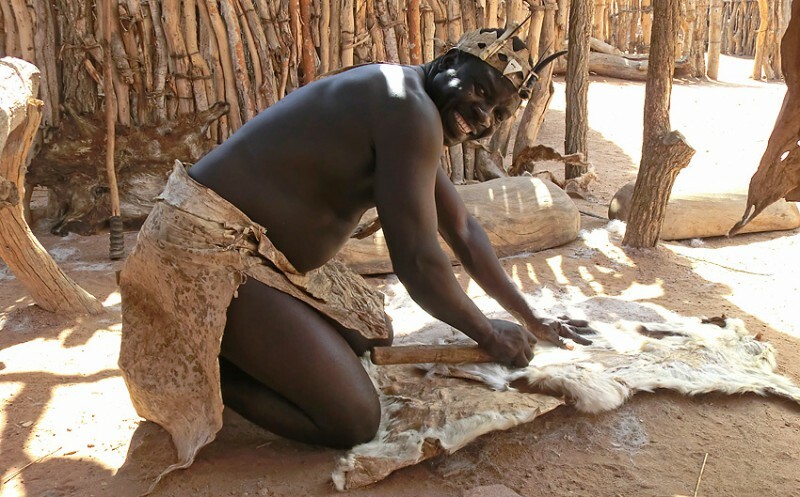 The Damara people are one of Namibias enigmas. 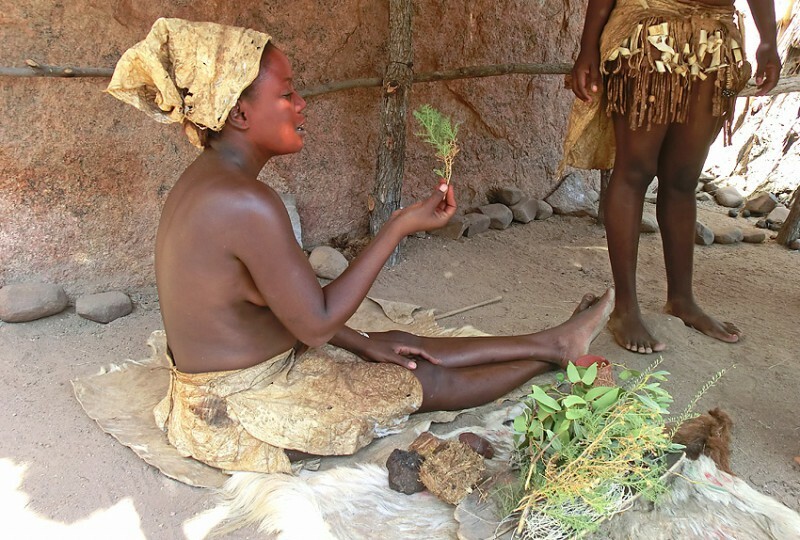 They are thought to be one of the original Namibian peoples. 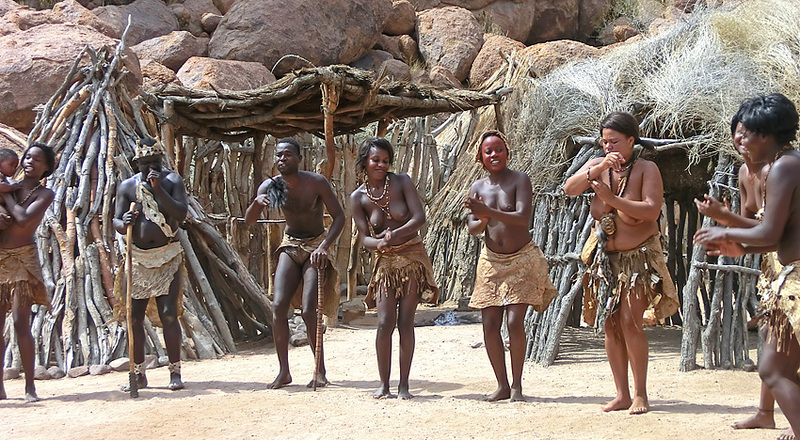 They have no known cultural relationship with any of the other tribes in Namibia but they share the language with the Namas. Very little is known of their origin. In this living museum an attempt have been made to reconstruct the old Damara culture. We started with the use of nature. We were shown different plants and how they were used. We were told that since the people here has got long distances to mediclinics these herbs are still being used. 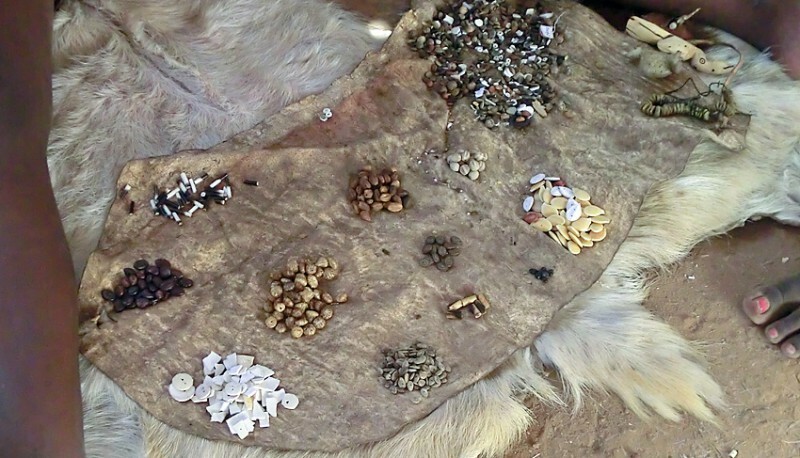 …and here he shows us how to prepare a goat skin. …and Saga tried drilling a hole to make a button out of a piece of Ostrich shell. We were also shown how the Damara blacksmiths used to work, to make knives and spearheads. …to give us a truly enthusiastic show. Thank you chief and thank you Damara people for sharing your history with us! Vilka fina bilder! Hur många timmars körning från Windhoek??? Vi körde dryt fem timmar till lodgen, sen ca 2 timmar till det här stället. Take it from a Namibian, they belong to the same group of people as the Himba/Herero, Ovambo, Kavango etc. They’re not one of the “originals” of the land (that would be the Khoisan peoples) They may have ventured down into Namibia before some of the other groups of people who came from the north settled there, and therefore assimilated into the culture of the natives (Namas & Khoisans) , and thusly learned the Khoekhoe language and abandoning their own language over time. Oh, and I’d appreciate if you stopped using the term “tribe”. It is a racist colonial term. We don’t refer to ourselves as coming from any particular tribe when talking amongst ourselves, in fact, there’s not really a proper word from “tribe” in my language (Oshiwambo) (or any other Namibian language that I’m aware of). “Nation or People(s)” is a more accurate term. 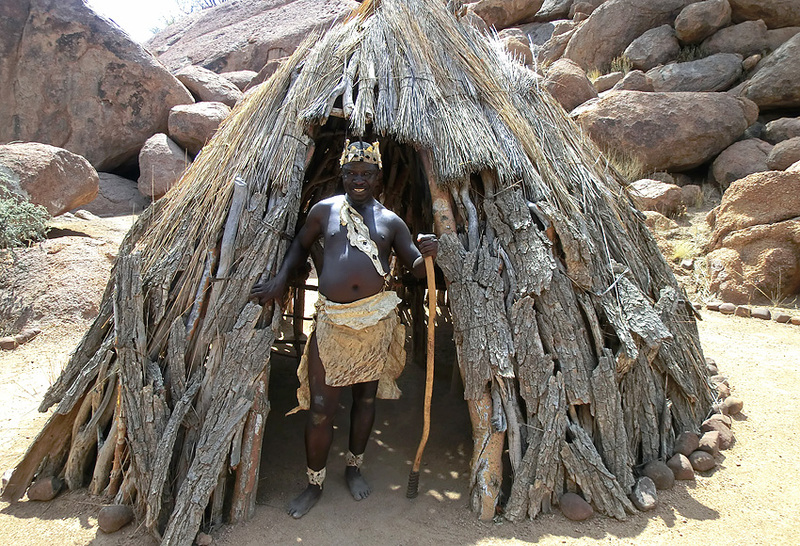 To give an example, there are about 1,5 mill Ovambo people in total, they make up 50% of the Namibian population. That means that there are about a million Ovambos living in Namibia today. That is about one fifth of the total population of Norway, one ninth of the population in Sweden and so forth. Another example is the Zulu people of South Africa, they’re abotu 8-9 mill in total, which is more than the population of Norway combined, and about the same as the population of Sweden. The point I’m trying to make is that it is extremely condescending to refer to any of us, regardless of what people we belong to, as tribes. I’d only accept that term if people from Europe refer to themselves as Goths, Visigoths,Vandals,Franks, Normans, Saxons, Gauls (Tribes) , but you/they don’t. It is completely disrespectful towards us, and other africans as a people. In Sweden we also have different people or tribes. We are one nation but not the same people. What is so wrong with “tribe”? Namibia is a nation – you can’t have different nations in one nation? So what term for different people in the same nation?